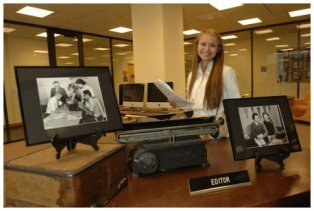 Loyola University New Orleans student journalist Lucy Dieckhaus is recognized among the top 10 college reporters in the nation. She is a finalist for “Story of the Year” from the Associated Collegiate Press for her coverage last year of the Student Government Association featured in The Maroon, Loyola’s student newspaper. Dieckhaus, a junior in the School of Mass Communication and the current news editor of The Maroon, is recognized along with students from large journalism schools including University of California Los Angeles, Indiana University, Louisiana State University, Fordham University, Syracuse University and Virginia Tech. The latest accolade caps the end of a successful awards season for Loyola’s Student Media. In all, students brought home 16 awards from regional and national press organizations this year. “This is a terrific honor and the second time in two years that a Maroon reporter has been recognized as a ‘Story of the Year’ finalist,” said Michael Giusti ‘00, M.B.A. ‘12, journalism instructor and Student Media adviser. Last year, former Loyola student and Maroon reporter Karin Curley ‘12 was nominated for her coverage of the declining number of Jesuits and its potential effect on higher education administration. Wolf editor and mass communication senior Shannon Donaldson was recently honored with a nomination for best feature story at a small school by the Society of Professional Journalists, putting her among the top three small school feature writers in the nation. Please contact Mikel Pak, Loyola associate director of public affairs, for media interviews at 504-861-5448.